Originally from Pittsburgh, PA, Key West icon Zack Seemiller moved to the island 20 years ago. He arrived in Paradise as the leader of a band called Grooveyard. They took the island by storm and Zack has never looked back. Established as one of Key West’s favorite entertainers, Seemiller remains one of the busiest men in Key West show biz, often playing two or three gigs a day. In addition, Zack performs as a stand-up comic at various events on the island. Notorious for his comedic delivery between songs, Seemiller has a loyal fan base. 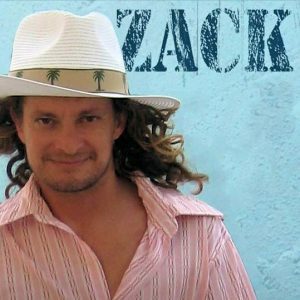 A true entertainer in every sense of the word, Zack is also a talented singer and songwriter. Although generally a solo artist, Zack often teams with Caffeine Carl to perform with a full band. Those shows are always entertaining and showcase Zack’s natural talent as a brilliant front man.